The stone produced at Kellys of Fantane is of such a high quality, single size & superior shape that the County Tipperary quarry is the first port of call for County Councils undertaking new road construction projects not just in Munster but from all over the midlands, south and beyond. We met up with quarry manager Alan Kelly to get an insight into the history and current well-being of this exceptional third-generation family business. Kellys of Fantane have been in operation since the late 1940s and have forged strong business relationships with their clients over the decades through professionalism and consistency of both superior product and service. The company has made a significant contribution to Ireland’s infrastructure through involvement in some of the country’s major road projects, including the M7 Nenagh to Castletown Motorway, the Ballaghaderreen Bypass, the new N8 Arklow Motorway, the Cashel Bypass and link road, resurfacing of the N8 in North Tipperary and Laois. Kellys offer a wide range of top quality building materials, including bituminous materials, concrete blocks, readymix concrete and quarry products. All products are designed to exceed customer expectations while an in-house Quality Control team ensures that all products meet the requirements of exacting current standards and specifications. Kellys of Fantane produce a wide range of bituminous materials from their fully automated tarplant. All of the bituminous products produced comply with the requirements of the National Roads Authority Specification for Road Works, Series 900. The range of bituminous products offered include dense base, HDM base, dense binder, HDM binder, close surface course, open surface course, dense surface course, Hot Rolled Asphalt, SMA 6, SMA 10 and SMA 14. All aggregates used to make the macadam and asphalt mixtures are produced in Kelly’s own quarry using High PSV Aggregate. Meanwhile, their 20mm high PSV coated chippings are used nationwide and can be produced at relatively short notice and delivered to any location. Kelly’s produce only EN 206 compliant ready-mix concrete. It is produced to the very highest standard at their two state of the art ready-mix batching plants. Each plant is capable of delivering 60 cubic metres of ready-mix concrete per hour. Kelly’s concrete block plant can produce up to 7 million blocks per year, ensuring that all customer needs are met. The batching plant is fully automated and computerised. Standard blocks (hollow or solid), high strength blocks and special blocks of varying shapes and sizes are all manufactured for a full range of construction projects, from home to offices and schools etc. Kelly’s produce numerous stone products for various markets. 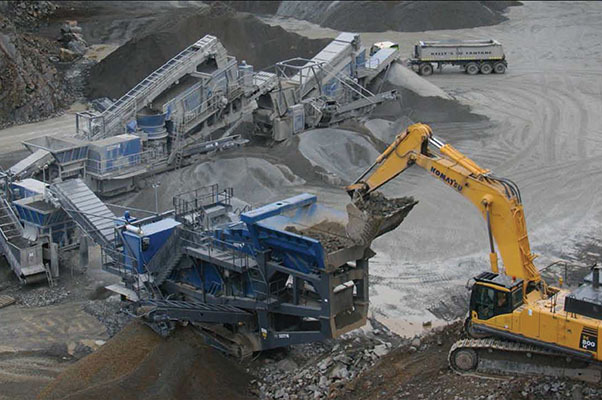 The primary, secondary and tertiary aggregate crushing and screening plant used at Kelly’s quarry is capable of producing any size and grade of stone required. Some examples of stone produced at present are SR21, 14mm, 10mm and 6mm single sized chippings, Cl.503 pipe bedding, Cl.505 filter stone, 4” clean, 4” down etc…. Over eight decades – powered by an exceptional product and unrivalled service – Kellys of Fantane has evolved into a major player in Ireland’s road construction industry. Like everyone else in the industry we were not immune to the abrupt downturn of the recession, however we are glad to say that we have weathered the storm and are going from strength to strength. Between office and sales staff as well as quarry personnel, drivers and Civil Engineering contracting staff, Kellys of Fantane currently provide gainful employment to a highly-professional and experienced team of 60 & also uses Subcontractors. With demand on the up, things are moving forward at an encouraging rate. “Recently, we have been, laying CBM (cement bound material) on the Arklow Bypass, which was a nine-month project,” Alan notes. Kellys operate a fleet of 15 tippers and six artics, as well as subcontract hauliers ensuring delivery promptly anywhere. All fleet maintenance and repairs are carried out in-house in their own garage / workshop, where four mechanics are employed full time. All products and materials are produced to the absolute highest standards. Kelly’s boast an impressive seven NSAI Product Certifications at present that include EN 206 for ready-mix concrete, EN 13108 for bituminous products, EN 13043 for high PSV chippings, EN 13242 for unbound aggregates and EN 771 for concrete blocks.At the heart of the operation is the incredibly high-quality stone quarried in both the Fantane quarry & Latteragh Quarry. “It’s a very hardwearing, durable stone and that’s why Councils from all over Ireland are looking for it,” says Alan. “We have sold to Galway, Kildare, Laois, Offaly, North Tipperary, South Tipperary, Kilkenny, Limerick, Waterford, Cork and Mayo County Councils and continue to experience huge demand. We are in a strong position going forward. We have experienced a gradual upturn in business in recent times in all aspects of our business. One of the real beauties of Kellys of Fantane is that they operate a veritable one-stop shop, supplying local authorities and civil engineering companies alike not just with quality materials but also with a specialist service & machinery for any contract. Investment in the best plant and equipment ensures an excellent all-round service. For example, they own and operate a full-width 12-metre paver that pulls the full carriageway in one go - the only one of its kind in Ireland as well as other various width pavers down to a metre mini paver which is used to machine lay footpaths. The quarry contains one of the largest mobile crushing plants in Europe, capable of producing 500 tonnes of processed aggregates per hour. This typifies a wholly progressive operation that is positioned at the forefront of the Irish road construction materials supply sector. Three generations and eight decades in, Kellys are just getting warmed up!